A true master in the international music scene returns to Columbus next week. 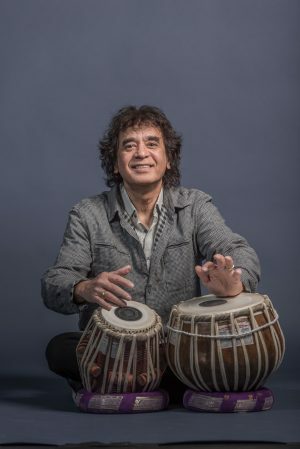 Grammy-winning classical tabla virtuoso Zakir Hussain (photo by Paul Joseph) leads his band Masters of Percussion at the Southern Theatre on Wednesday, April 17th at 8pm. Tickets are available through Ticketmaster here or via other methods below. Hussain’s band is “a mesmerizing ensemble of masters in Indian classical music” including Niladri Kumar on sitar, renowned jazz drummer Eric Harland on Western drums, and the Kerala Drummers from the southwestern coast of India. Masters of Percussion grew from Hussain’s duet tours with his late father, the legendary Ustad Allarakha, and 2019 marks the centennial of Allarakha’s birth, so this will indeed be a tour to remember. Keep reading for full details from CAPA on a special genre-bending night recommended for all music fans. Masters of Percussion grew from Hussain’s duet tours with his late father, the legendary Ustad Allarakha, and began biennial appearances in 1996 to provide a platform for rarely heard rhythm traditions from India. Over time, the ensemble expanded to include great drummers and percussionists from many world traditions, including jazz, as well as the occasional stringed instrument. 2019 will be the centennial year of Allarakha’s birth, so this will be a very special MOP tour. Harland is the most “in-demand” drummer of his generation primarily, but not exclusively, in the world of jazz. He has worked on more than 400 recordings and film scores and shared the stage with masters on the order of Betty Carter, Joe Henderson, McCoy Tyner, Michael Brecker, Terence Blanchard, Branford and Wynton Marsalis, Wayne Shorter, Savion Glover, and the SF Jazz Collective. He’s also played with virtually all the current rising stars, including Esperanza Spalding, Jane Monheit, Taylor Eigsti, Julian Lage, Stacie Orrico, and Robert Glasper. Harland currently works in multiple groups, including James Farm with Joshua Redman, Prism with Dave Holland and Kevin Eubanks, Sangam with Charles Lloyd and Zakir Hussain, Overtone with Dave Holland, Jason Moran, and Chris Potter, and his own Voyager.Outside jazz, he’s also collaborated with Les Claypool’s Primus, John Mayer, Mariah Carey, Steve Miller, and Spike Lee. Harland was resident artistic director at the SF Jazz Center for the 2014-16 seasons and the artist in residence at the 2014 Monterey Jazz Festival. After his extensive travels, he has come to realize that “The deepest secret is that life is not a process of discovery, but a process of creation.” That depth of understanding makes him a perfect member of Masters of Percussion.